4 lectures, 4 talks, 4 approaches. 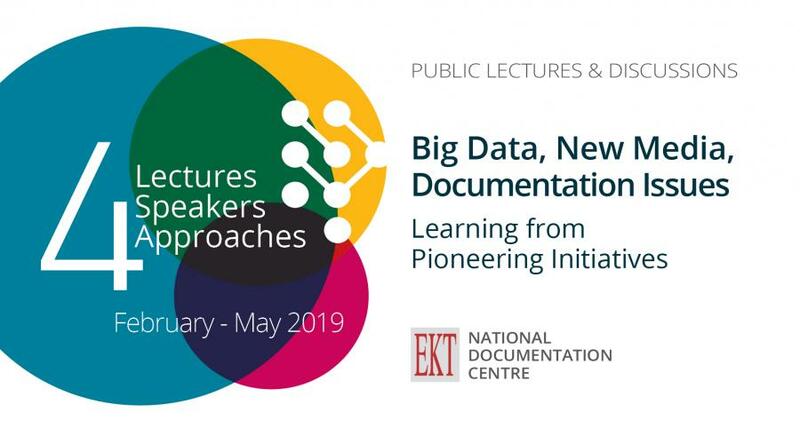 There will be a new series of Public Lectures-Discussions,'Βig Data, New Media, Documentation issues- Learning from Pioneering Initiatives', starting on 6th February and ending on 8th May. During 4 two-hour lecture- discussions at the National Hellenic Research Foundation, four distinguished speakers with backgrounds in the Humanities, Social Sciences and Natural Sciences, will share their own viewpoint on the topic. These speakers have extensive experience in the management and documentation of big data and have been selected based on their leading role in pioneering related ventures. The first lecture is on 6 February 2019 (18.00-20.00, in the L. Zervas amphitheatre NHRF and is in English. It will be given by Andreas Fickers, Professor for Contemporary and Digital History, Director of the Luxembourg Centre for Contemporary and Digital History (C²DH), Head of the Digital History Laboratory. On 20 March 2019 (18.00-20.00), the session will be in Greek and presented by Christos Arvanitidis, Head of Research, Institute of Marine Biology, Biotechnology and Aquaculture, Hellenic Centre for Marine Research (HCMR). Attendance is free of charge (no registration is required). See the lecture programme.